In video games, graveyards usually spell trouble. Ico didn’t disappoint. This year, part of my backlog clearing strategy is to play games in series before their sequels or marginally related entries come out. In the case of 2001’s Ico and 2005’s Shadow of Colossus, I figured that I should at least play Fumito Ueda’s two highly-revered games before experiencing his latest world and creation, that’s now nine years in the making. Somewhere out there, there’s a hypothetical someone saying that I’m fortunate to be playing these two games for the first time. Having now finished the 2011 PS3 remaster of Ico, that’d be a good assessment. There were times when Ico proved a trial in platforming elements, particularly in the final areas beneath the castle. Spinning wheels and platforms were sudden challenges for the game at that point which had primarily focused on puzzle elements. It made the end journey after that point a straightforward one. One that required determination and a haul to reach the final confrontation, and it’s all that mattered. Before the final chapter, there was a moment that really stuck with me which initially set the tone of the game—only for my thoughts to evolve and become something more as the game progressed. The incident happened during the first time in the graveyard. During the first couple of hours of Ico, save points are frequent and without too much danger surrounding them. The game gave me this false sense of security only to take it away once I got to the graveyard. The onslaught of the shadows kept coming, and for the first time I actually felt panic even though the save point was technically nearby. At that point, it was basically inaccessible. The graveyard was huge, and not even terribly frightening in how it looked. Graves could have been a part of the scenery that blended in with the rest of the dreary castle. They looked like stone beds set upon grassy areas but there was nothing extraordinarily creepy about them. What became a source of tension was that the area had multiple entry points for shadows to appear and take Yorda into. And they did. Then something happened I was not expecting—I left Yorda for too long in a room near the graveyard, as I was off exploring and trying to figure out what to do. I heard her gasp, only to rush back to see her being taken by the horde. It was a nightmarish moment for me but it didn’t stop there. Instead of clearing the shadows after I released her from their grip, I launched myself to a ledge and called to her. It took a little bit of faith and all the patience I could muster to wait for her, and believe that she’d grab my hand in time to get pulled to safety. It was excruciating but we eventually made it. There were no further incidents that left me feeling uneasy, as with that brief moment I had in the graveyard. The experience taught me to be alert and it was a quick, hard lesson. I learned to manage the shadows as I continued my playthrough. They became annoyances more than scares—things that loved to knock me down, with the struggle to get back up an oft frustrating experience. Yorda rarely succumbed to their attempts at kidnapping, save a few times when I had to figure out a puzzle. But I never felt that pang of fright again. What I did feel, though, in one of the final moments of the game, was sadness. Sadness at the realization that the shadows were also children with horns—corrupt and vicious. It gave the graveyard scene a different meaning. It gave the entire game a different meaning. After fifteen years since its release, I finally understand what makes the game special, and I feel fortunate it was released as is. I learned what many of you already know: Ico is a gorgeous, desolate game. During the first encounter with Yorda, I found myself (as the protagonist) grabbing her hand and pulling her away in a desperate attempt to escape danger. As the game progressed and Yorda contributed nothing by being a Princess in need of saving, my frustrations presented in grabbing her hand to speed up her labored steps. She was wasting my time as I saw puzzle solutions right in front of me, but had to wait for her to comply with my instructions. It was an awful feeling that the game made me acutely aware of when one of the game’s final moments highlighted Yorda as the protector. Ico just about ruined me in its last scene on the blinding white sand, when the camera panned to a close up of her hand—the same hand that I grabbed out of impatience on countless occasions. 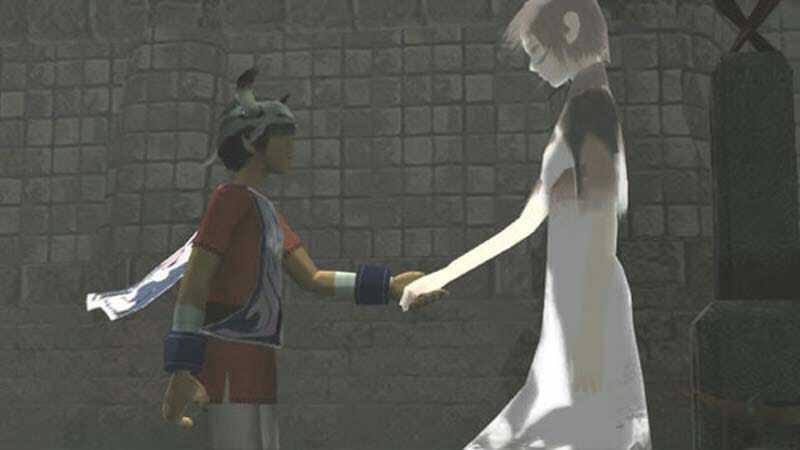 Ico deliberately cast Yorda into an assumed role of a burden to deliver its heartbreaking reality. Reflecting on it now—when Yorda was surrounded in the graveyard and I tried to fend off the shadows, I was playing just another game. One that frightened me in a traditional sense for making me feel anxious at losing to the supernatural. It was pure desperation. By the end, when Yorda became stone-like and couldn’t move, and couldn’t grab Ico’s hand, no matter how much I pressed the button dedicated to that action, or how much Ico pleaded while fending off the shadows of children who suffered Ico’s would-be fate; I was playing something more. It was pure desperation, burdened with sadness.